Back in May, I was having breakfast with a friend, who was interested in applying to become a 2018 Surge Fellow, when a number I did not recognize appeared on my phone. We were deep in conversation so I ignored the call. After my friend and I said our goodbyes, I realized the urgency upon seeing multiple missed calls from the same number along with a voice message. As I headed to my office I called the number back. What happened next would prompt a major shift in my professional life and leadership journey. Less than two weeks after that call, I accepted a new role as Executive Director of Spark in Chicago. Like many transitions in life, the opportunity was unexpected. Yet as I reflect upon it now, I realize this moment, this new role, completes a full circle journey that began more than three years ago. When I applied to join the inaugural Surge Fellowship cohort in 2015, I did not get accepted. I was crushed. But I sought feedback, and after receiving it from Carmita Semaan and the Surge team I knew I had work to do if I was wanted to be fully prepared for the opportunity the next time around. Despite my disappointment, the Surge application and feedback process helped me articulate my aspiration to lead a nonprofit organization focused on creating mentoring opportunities for students. Growing up in middle class neighborhoods across the Midwest and East Coast, I was fortunate to be exposed to a myriad of opportunities that expanded my view of what was possible for my future. All of this exploration was made possible with the support of mentors who inspired me to dream big and a strong educational foundation that equipped me with the skills to succeed. Yet far too many young people in Chicago do not have these opportunities. It is the reason I am deeply passionate about helping black and Latino youth gain exposure to diverse experiences and make connections to caring adults who can help them realize their potential. A year and a half later, I applied to the Surge Fellowship again. In the time between applications, I had transitioned to a new role and refined my vision for my leadership. I was still passionate about providing students with mentoring opportunities but focused less on the job and more on the impact. This time I was accepted. I am now an alumni of the 2017 Surge Fellowship. The experience prepared me to seize the opportunity at Spark when it arose. My Surge journey was not only about gaining the executive skills to be a more effective leader but—most importantly—Surge allowed me to develop confidence in the distinct perspective I bring to the work as a black woman. In my new role at Spark, I’ve found my dream job and I am in a position to provide students with the opportunities they deserve. Yet my story doesn’t stop here. In fact, this is just the beginning. I have a renewed sense of responsibility, an obligation to remember where I came from and use those experiences to shape how I lead. I must dream bigger and fight to ensure middle school students understand, experience and pursue what’s possible. That doesn’t mean self-doubt doesn’t still creep in or that I won’t face challenges, but through Surge, I now have a village of supporters to help me combat any obstacle I face and whose work I can amplify to create even greater opportunities for our kids. 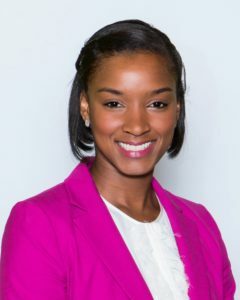 Ashley Richardson is the Executive Director of Spark in Chicago, a non-profit that engages communities to provide career exploration and self-discovery opportunities that help middle school students understand, experience and pursue what’s possible. As Executive Director, Ashley has overall strategic and operational responsibility for Spark Chicago’s regional staff, program, expansion, development and mission execution. In addition, Ashley is an active member of the organization’s national leadership team, shaping key opportunities and strategies for Spark organization wide. 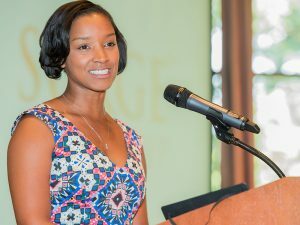 Ashley previously managed special projects at The Chicago Public Education Fund (The Fund), an organization whose current efforts seek to more than double the number of high-quality principals in Chicago. Ashley holds an Master of Education in education policy and management from the Harvard Graduate School of Education and a Bachelor of Arts in sociology from Vassar College. In her free time, Ashley enjoys exploring Chicago’s great restaurants, volunteering with iMentor Chicago and developing her salsa-dancing skills.